If there is a single common thread that weaves through the Corvette hobby, it is performance. Corvette owners rest easy at night knowing their choice of transportation is unparalleled when it comes to styling since Corvettes of any year are instantly recognizable. The sleek shape has turned heads ever since its introduction in '53, and the changes over the years have simply turned up the wow factor. However, styling aside, when you get a group of Corvette enthusiasts together, the talk will eventually turn to performance - and how to get more. Whether it's engine modifications, better exhaust systems, computer chips, braking prowess or suspension, Corvette owners are always in line for upgrades to make their dream car just a little more special. The breadth and depth of the possible modifications are nearly limitless. For some, nothing less than a complete engine rebuild is the ticket to greater performance, but few Corvette owners have the time or the inclination to go through all the steps inherent in a plenum-to-oil-pan rebuild. The high rollers who can bankroll the construction of a killer Corvette need only drop their car off at the tuner's shop of their choice and bring the checkbook when it's done. For most of us, major rebuild projects are out of the question. And that's where bolt-on parts come into play. By adding external performance parts, you can achieve many of the performance gains you're looking for, and for a lot less money. From light engine mods to a change in exhaust, brakes, suspension and a wide array of other additions can make any Corvette run faster, stop quicker, corner better and ride like new. Part of the key to adding bolt-on performance parts to Corvettes is understanding how each modification correlates with other systems. The addition of a free-flowing air cleaner, computer chip and less restrictive mufflers will provide an immediate 10-15 percent gain in horsepower. Improving airflow into the engine helps the motor breathe better, but a lot of this gain is negated if the properly calibrated computer chip isn't in place. There are many performance chips available for Corvettes, and now there are even ways to upgrade the later non-removable chips. Before you start bolting on parts, there are a couple of points that need to be addressed. First, make sure your Corvette is tuned up. After all, if your car isn't running right to begin with, all those add-on parts won't make a difference. For older Corvettes, Kanter Auto Products offers a complete tune-up kit which includes new points, condenser, distributor cap, rotors and spark plugs. One of the easiest improvements you can make to your engine's performance doesn't require any tools at all. Replacing your engine oil with a synthetic oil like Mobil 1 or Red Line will result in an immediate gain in lower engine operating temperatures, and that means better performance. If you've got a late-model LT1 Corvette with a computer that does not have a removable chip, don't worry. The Power Programmer from Hypertech can work wonders. The Power Programmer simply plugs into the under-dash diagnostic plug and a push of the button re-tunes the computer - no tools or computer modifications are required. Testing has shown the Programmer improves both elapsed times and speed. 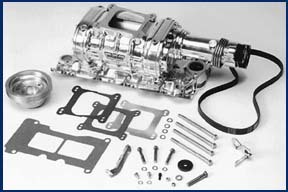 Hypertech also offers a Power Programmer for LT4 engines, so you're covered on Corvettes right through 1996. When it comes to reprogramming computers, Performance Resource has anything Corvette owners from 1984 and up might need. Testing has shown Performance Resource units on 1994 and later LT1 engines boost quarter-mile performance up to one full second while also improving throttle response. They will also customize your computer to work with any level of existing or anticipated engine mods. Corvette Performance also offers a computer tuning device - the Power Control Module. This module contains a microprocessor that re-tunes the air/fuel ratio, ignition curve and other parts of the engine management system to provide increased performance without sacrificing driveability or gas mileage. Improving the airflow into your engine can be as easy as replacing the air filter with a free-flowing K&N type of filter or switching to a "forced air" type of air induction system. From there the choices become more complex: For more instant performance, a nitrous oxide system or installation of a supercharger can provide a wad of horsepower on command. While the L98's and LT1's systems are designed to provide good across-the-board performance, there are a number of products available that can improve low-end torque and horsepower. We all know a cooler engine is a faster engine, and this G2 Cooling Fan Switch from LG Motorsports will help your LT1 engine beat the heat. The unit utilizes a bi-polar switch which turns both cooling fans on at 200 degrees and shuts them off at 185 - great for street or strip. Designed for the factory PCM, no cutting or splicing is required. LG Motorsports also has switches available for 1985 and up TPI Corvettes. Cold air induction packages like this one from Corvette Performance will increase low-end torque and cfm flow. The new air boxes are positioned 180 degrees from the stock setup to provide colder, denser air and up to 25 percent more air flow. This system is an excellent start if you plan to modify the plenum or runners. Now that you have better airflow, pay attention to the temperature. The folks at Howell Engine Developments have an easily installed remote Manifold Air Temperature sensor that allows you to relocate the sensor further forward so it isn't influenced by manifold heat. Thus, when things get hot underhood, the air/fuel ratio won't become excessively lean. It's no secret that the stock Mass Air Flow (MAF) sensor on '85-'89 TPI engines represents a significant airflow restriction. But you don't have to cut the screens out of your stock unit; instead, you can replace the whole thing with a TPI Specialties-modified MAF sensor. The modified sensor allows freer breathing and a corresponding power increase. Once you've gotten more air to the engine, you have to do something with it. Throttle bodies, like these from Arizona Speed & Marine come in 52mm and 58mm sizes and flow as much as 30 percent more air than the stock throttle body. The 52mm body has an integral air foil built in for a perfect fit and even better flow. Want big-time acceleration gains? A Vortech Supercharger kit can make big horsepower instantly - up to 430 horsepower with no other engine mods. The benefits of a supercharger include lower operating temperatures, and there's no lag time needed for the charger to spool up. Installation requires a few modifications to the engine compartment and the accessory drive system, but the installation can be done in one weekend. For carbureted engines, Weiand has come up with the industry's first legal roots-type supercharger for small-block Chevys. The 50-states legal unit will fit Chevy small-blocks from 1962-1986, and bolting this baby on can provide a power boost of 45 percent, according the manufacturer. Fax: 602-352-8445 CNC Cylinder Heads, Inc. Copyright(c) 1996: Dobbs Publishing Group.